Terrafirma recovery gloves are manufactured tough to handle the rigours of handling 4x4 winching and recovery equipment but also supple enough to be used for general tasks to protect and keep your hands clean.<br> <br> The palms and finger reinforcements are made from tough, hard wearing, shrink resistant synthetic leather and the backs are breathable spandex for snug fitting flexibility with an elasticated cuff to keep debris out.<br> <br> These super comfortable bright red and black gloves are ideal for technical jobs in harsh conditions.<br> <br> Available in sizes Medium TF3312M and Large TF3312L. Terrafirma recovery gloves are manufactured tough to handle the rigours of handling 4x4 winching and recovery equipment but also supple enough to be used for general tasks to protect and keep your hands clean. The palms and finger reinforcements are made from tough, hard wearing, shrink resistant synthetic leather and the backs are breathable spandex for snug fitting flexibility with an elasticated cuff to keep debris out. 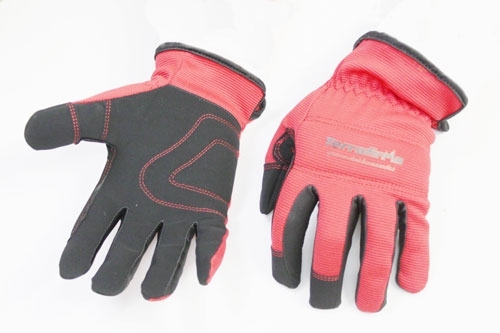 These super comfortable bright red and black gloves are ideal for technical jobs in harsh conditions. Available in sizes Medium TF3312M and Large TF3312L.